This page began as a way to show off the pictures we (Deborah Peters and Stephen Bloch) had taken of various reconstructed medieval pavilions we've lived in and/or built. But I anticipate it becoming also an impetus to discussion of various designs for medieval tents, how to build them, how to live in them, etc. Accordingly I've put in a Taxonomy of Tent Designs discussing different structures and construction methods, a collection of medieval pictures of tents useful as iconographic evidence, a custom tent measurement calculator, and links to as many other relevant Web sites as I could find. If you find bugs in the calculator, if you know of other sites I should link to, or if you can contribute good pictures or descriptions of reconstructed tents, please e-mail me. Note: we are not in the business of building and selling pavilions. We do not have a catalogue, we do not have a price list, we do not have a mail-order policy, etc. I'll be happy to provide suggestions and moral support from my experience and that of other tentmakers I know, should you be inspired to build your own, but I will not build your tent. Many of the pictures on these pages are shown in "thumbnail" format, linked to larger versions of the same picture. So if a particular picture piques your curiosity and you want to see more details, try clicking on it. We originally developed our interest in this area through our participation in the Society for Creative Anachronism, a medieval hobbyist organization whose tens of thousands of members cover a vast spectrum of historical accuracy and interests. At the "high-accuracy" end of this spectrum are people doing academically credible, museum-quality research and reconstruction. Other members are more interested in sword-fighting (as a sport, not a research area), flirting, and drinking homebrew (not unworthy aims in themselves -- I've tried a little of all three). More recently, we've been participating in La Belle Compagnie, a Hundred Years War living-history group. 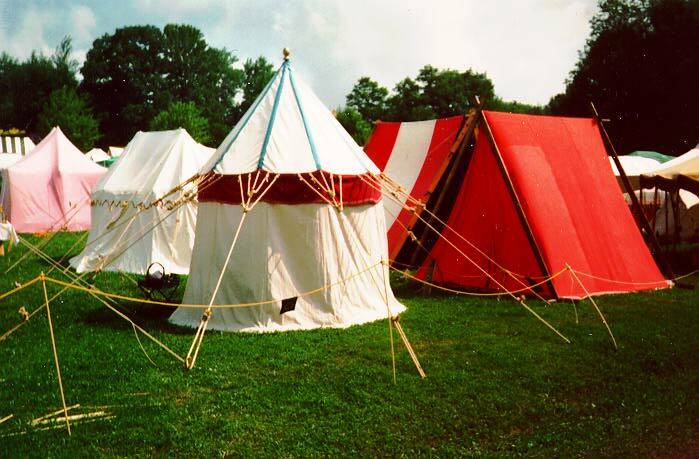 Anyway, this Web site aspires to the "high-accuracy" end: I'm interested in how tents were actually built and used in the Middle Ages, and how to reconstruct them today. 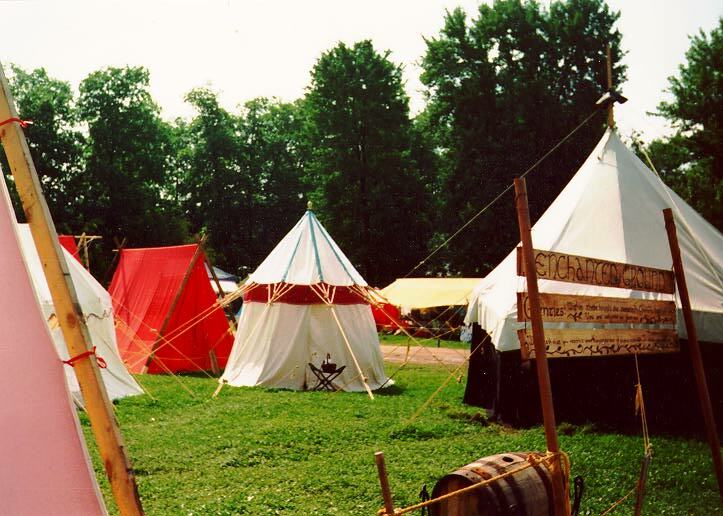 Many of the photographs on this site, and much of the testing experience of the tents discussed here, are from the Pennsic War. 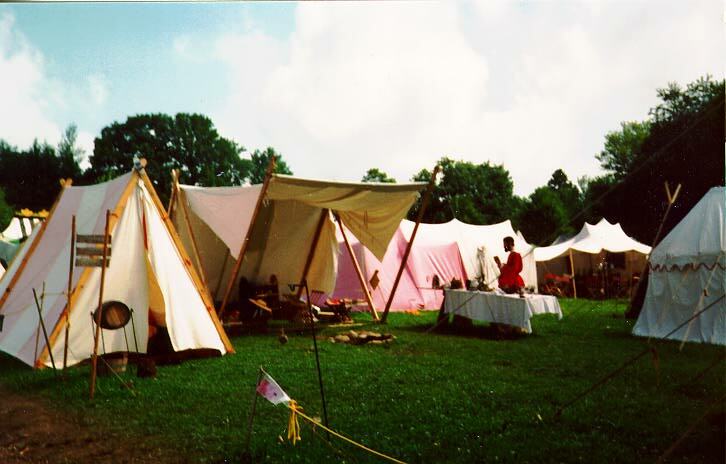 This largest event of the SCA year is held in western Pennsylvania in early to mid-August, and attracts approximately 10,000 participants (from both the SCA and other medievalist groups), some of whom stay for as long as two weeks. At this event, and at numerous smaller and briefer events, most participants sleep in tents or pavilions of some sort, varying from blue plastic tarps to high-tech backpacking tents to careful reconstructions of actual medieval tents. 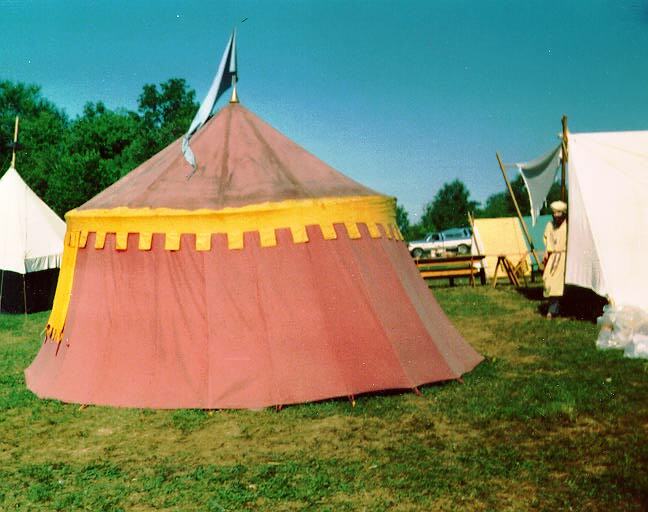 We held a panel discussion of tentmaking techniques at Pennsic 1997, with a one-hour field trip to examine the participants' own efforts. Interest was high, and the level of expertise of the participants varied from Myfanwy, who'd built one pavilion, to us, with two, to Mistress Barbary, at several hundred, to the people from Medieval Miscellanea and Tentmasters, who had built and sold thousands. I was somewhat surprised that so few people showed up wanting to show off their own efforts on the field trip. A similar class has been held at Pennsic each year since. Each year the number of participants, and the number of pavilions to visit, has grown, and the field trip has stretched to three hours (for the die-hards who last that long). Note to participants in past classes: I saw a number of you taking photographs, both full-view and detail, of the tents we visited. If anyone would like to contribute photographs to this Web site, I'd be very grateful; please contact me at sbloch@adelphi.edu. Deborah and I have for a number of years been part of the Enchanted Ground camp at Pennsic. Enchanted Ground, founded by Duke Cariadoc of the Bow, is based on the conceit that, due to some sort of enchantment, this patch of ground is no longer a part of the twentieth century but rather of the Middle Ages. Inside it there is no discussion of things that didn't exist in the Middle Ages, and we avoid obviously modern camp gear: cooking equipment, bedding, clothing, and (most relevantly to this page) housing such as tents. We didn't build this one, we borrowed it from the (now-defunct) Gwyntarian Musicians' Guild. Although its shape resembles those of various medieval tents, its internal structure has no resemblance to any that I know of: it had a single center pole, with about a dozen ropes going up the pole, through pulleys or loops at the top, and down at an angle to the circular welded steel hoop that held the shape of the shoulder. This hoop was stabilized by a number of cross-braces (also welded steel, with lots of wing-nuts), the assembly and disassembly of which took hours of frustrating work and caused injuries ranging from mild burns (from steel sitting in direct August sun for hours) to bruises to badly pinched fingers. The main advantage of this structure is that no guy-lines extend beyond the footprint of the tent. At some point Deborah decided to build her own pavilion based on the many pictures of pavilions in King Rene d'Anjou's Book of Love, aka Le Cueur d'Amours Espris. We completed this pavilion as a joint project in 1994, aided by the Calon Scrolls special issue on pavilions. (The Calon Scrolls is the arts-and-sciences newsletter of the Kingdom of Calontir, which has something of a reputation for pavilioning.) More pictures (both of our pavilion and of those in King Rene's book) and construction details are on another page. When Deborah started building the first tent, she was single. By the time it was finished, she and I had met and were considering marriage. We quickly found the tent too small for both of us, a week's food, clothing, music, and musical instruments. So we built a larger tent in 1996, based on the pictures of oval pavilions in King Rene's book. More pictures, and discussion of construction details, are on another page. Oh, by the way, none of these tents, to my knowledge, has ever collapsed or flown away in a Pennsic storm. As I've paid more attention to pavilion design, I started trying to organize the many different designs to keep them straight in my own mind. The result is my Taxonomy of Pavilion Designs; additions and corrections will be cheerfully accepted! Look here for discussion of construction techniques. listed by source. If you have other such pictures, please contact me! These links include not only tents and pavilions, but yurts, sheds, taverns, etc. Disclaimer: I haven't assessed the quality of research going into all these pages; I expect the reader to do that for him/herself. Tanya Guptill (ska Mira Silverlock), another SCA member who builds pavilions, has developed a page on Medieval Pavilion Resources, including lots of on-line sources relevant to pavilion making, including a significant amount on Mongolian yurts/gers. She also hosts the Sacred Spaces Archive (Sacred Spaces is the newsletter of the Known World Architectural Guild, and this site includes a number of articles on tents, houses, and furniture). Karen Larsdatter's period illustrations of people setting up and taking down tents, and period illustrations of market merchant booths. 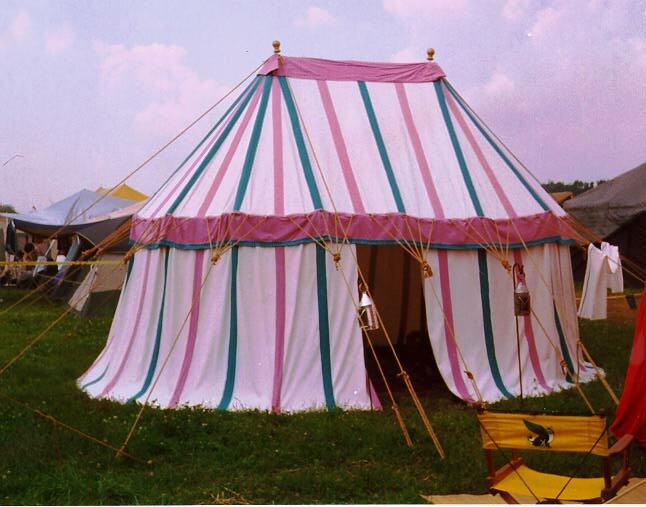 See also her blog posts on sixteenth-century tents and fifteenth-century tents. Lots of good links! Mark S. Harris's collection of Rialto articles on dwellings, with subcategories for tents, yurts, castles, cities, thatched huts, carpentry, etc. Pavilion Information from House Greydragon. This is apparently an SCA household that has built several pavilions on Daffyd's hub-and-spoke design (with some modifications which they say help the spokes stay in place). They also have a number of photos of a surviving 16th-century (???) pavilion in a museum in Basel, Switzerland. Max and Mickel's Easy No-Bake Pavilion, a different approach to building a circular tent. They point out that the design is equally usable with external guy lines, vertical side poles, or the hub-and-spoke construction. The page includes a lot of detail on the practicalities of construction and set-up, e.g. what kinds of seams, shopping list with prices, etc. Panther Pavilions, a commercial maker of medievalish pavilions. Past Tents, another commercial maker (in the U.K.). Best known for their hub-and-spoke tents. Four Seasons Tentmasters, another commercial maker. Dragonwing Pavilions, another commercial maker; this site includes a number of interesting articles about tent construction (and one about London Bridge!). Alexander the Lost's Griffin's Den tavern, set up on site at Pennsic. Devin O Raudh's wooden shed. Donna Hrynkiw's collection of illustrations of medieval tents (also flags and banners). Will McLean's blog posts about medieval tent construction, including lots of medieval illustrations, quotations and translations from tailors' manuals and account books about tents, and photos of his own reconstructed round tent (c1400 AD). I intend this section to eventually become a decent bibliography for tent reconstruction. But for now, I'll just put in a few entries; recommendations for others will be cheerfully accepted! Torvald Faegre, Tents: the Architecture of the Nomads. This book discusses a variety of tents built by nomadic cultures around the world: Bedouin and Berber tents in one chapter, Turkish black tents in another, Mongolian yurts in another, North American tipis in another, sub-Saharan felt huts in another, etc. Each chapter includes, if I remember correctly, photos, measurements, drawings of distinctive construction details, discussion of materials and why this particular tent design developed in this particular culture. The Calon Scrolls special issue on pavilions, "Pavilions: History and Construction" by Baroness Barbary Elspeth Ham and Countess Susannah Griffon, volume IV number 6. The Calon Scrolls is a regional newsletter of the Kingdom of Calontir, the SCA regional chapter covering Missouri, Kansas, etc. Nomad Tent Types in the Middle East, by Peter Alford Andrews. He's an academic whose particular research interest is Middle Eastern tents; I've exchanged some email with him, and at his request I've Webbed this announcement of his new book. An article by David Kuijt (ska Master Dafydd ap Gwystl) on his spoked pavilion design. These are the pages I know of that contain links to this one; if you're interested in this page, you may well be interested in other stuff on these pages. If I'm missing any, please E-mail me. Kostymelinker, somebody's page of links relevant to historical costume. I can't tell you much more than that, as I don't read much Norwegian. The Barony of Dragonship Haven in Connecticut. The Dwellings Page of the Anachronists' Encyclopaedia, maintained by the Shire of Uma (somewhere in Sweden). The Renendex, a collection of information about King René d'Anjou. H. Landon Falls, an SCA member at the University of Virginia. The Rowany Festival's Period Camp Page. The Rowany Festival is a major annual SCA event put on by the Barony of Rowany in Lochac (Australia), and it has its own version of Enchanted Ground.